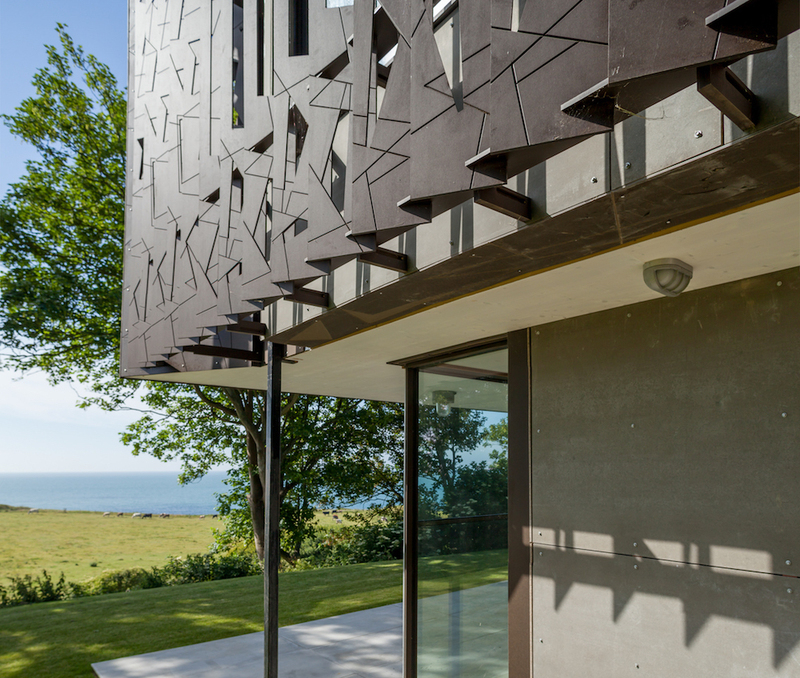 The Bunker is a new dwelling restored from a former WWII Radar Bunker on the Isle of Wight. The former Royal Air Force radar station was ideally positioned to monitor the south coast of Britain during the Second World War, as part of the Chain Home Network. After its service from 1941 until 1947, it became non-operational and the bunker was left to deteriorate and become derelict. Today, the bunker sits in the landscape with its concrete blast wall and abstract surrounding rock formation. 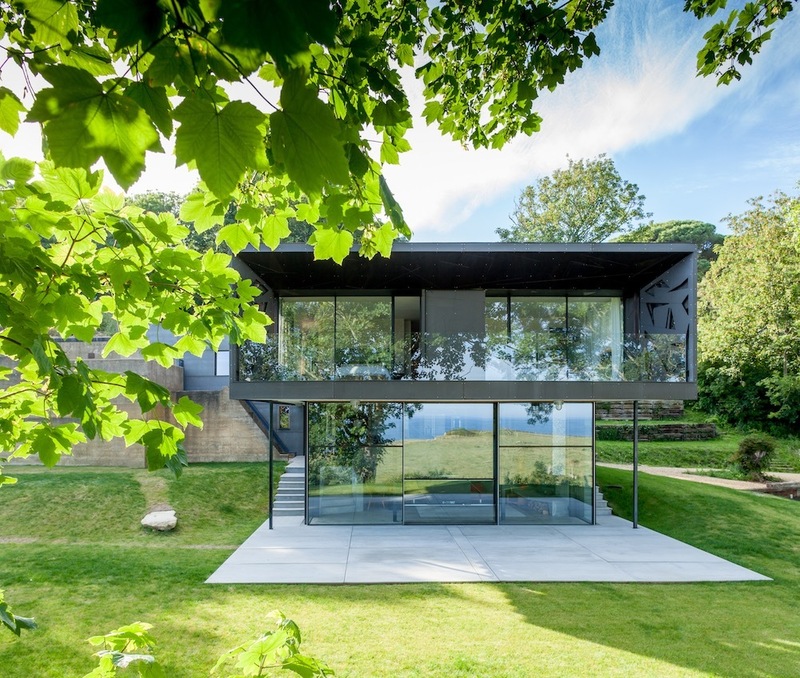 The new building, designed by Lincoln Miles Architecture responds to the Undercliff with a visual aesthetic of secrecy and danger unfolding the landscape's narrative. The new building extends in juxtaposition to the simpler bunker form with perforated Richlite camouflage fins, designed by Lincoln's partner, Artist Lisa Traxler. The fins repeat across the façade in a DAZZLE pattern synonymous with the history of camouflage and war. The doors and windows, with their incredible 3.2m high glazing, use a prototype framing system developed by Lincoln. The system has incredibly slim lines using CNC technology and paper composite material. Inside, the dazzle designs continue from the vitreous enamelled worktop to the bespoke suspended staircase. An airy aluminium foam material surrounds the fire place in the living room. Materials meet art informed by architecture, a visual narrative of a landscape. Lisa Traxler RWS MRBS, has created an immersive installation in reaction to this historical site. BUILD is a series of geometric steel constructions with a shattered composition of shape. An encrypted communication between landscape and architectural space, Traxler's work is informed by camouflage and radar drawn and fired in vitreous enamel and steel that interlock to create a visual interference in reference to the hidden messages of warfare. BUILD tours the Penwith Gallery in St. Ives, alongside the Surface Matter materials studio for London Design Festival, finishing at the source of response in the WWII Radar Bunker on the Isle of Wight in October 2017.